Antonio Malkusak, has 27 years of experience in the play and playground industry and is considered one of the leading experts on inclusive play environment design. 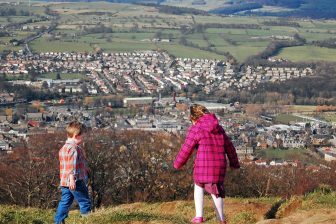 In this article for Child in the City, he discusses creating a barrier-free park. A very common and innocent exclamation used by millions of children every day across the world. To be welcomed and included in a play episode. It signaled the beginning of a great adventure – where that adventure led was up to the imaginations of you and whoever joined in on the fun. Was it getting to the top of the ‘mountain’ and looking across the vast wilderness? Or perhaps was it sharing stories with your best friend in a secret hiding place? Maybe it was using a swing, closing your eyes and taking off into outer space? It has been stated and backed by research that play is a fundamental building block for children to learn about themselves and the world in which they live. These great adventures of play develop a child’s life-skills. To be included and experience being involved is part of the joy of play. That is really the essence of play and why it is so important to create an environment where all abilities to play are valued. 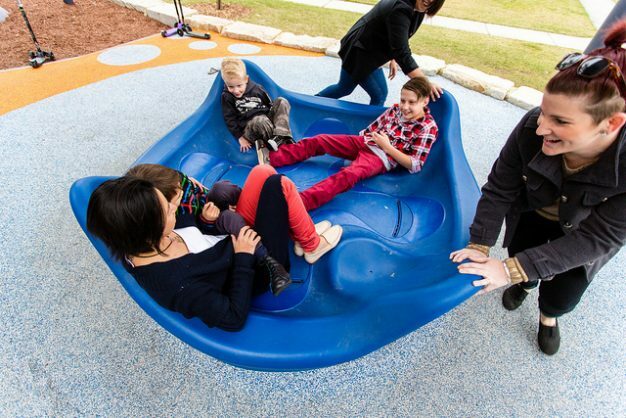 For designers and owner-operators, creating and offering inclusive play environments has been, and continues to be, a learning process. Back in 1990, when the Americans With Disabilities Act came into being, we applauded the new Act and fully supported the notion all public spaces should be designed and maintained so everyone had the opportunity to access and participate. The challenge we had was no roadmap to make new and renovated spaces accessible for outdoor public play environments. How were we going to accomplish this task? The beginning part of the process was to look at how the physical space itself was designed. For play areas, we wanted to make sure users were able to approach, enter, and use the play components within the playground. The design process centered on our ability to count components, elevate the ground level, and measure physical spaces, accessible routes, reach ranges, etc. It was a good first step in the process; however, we still needed a learning curve on understanding the range of abilities and users who had disabilities. 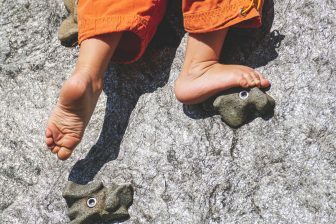 Not only was it important for physical barriers to be removed so children and caregivers can get into the play area, but a roadmap was established for playground design so children of all abilities can engage in meaningful play episodes. Playgrounds can be designed where all children can use the components. How many children have disabilities? What types of disabilities did these children have? According to the National Center for Education Statistics, in a study from 2008-09, a little over 13 out of 100 elementary & secondary school children had a disability. Of those 13 children; approximately 10 per cent had physical disabilities such as mobility impairments, approximately 30 per cent had sensory and/or communication disabilities such as hearing loss or speech/language, and approximately 60 per cent had cognitive disabilities such as learning disabilities, traumatic brain injury, and autism. Armed with this information as a guide, we can better create environments that are inclusive of all abilities. The common perception of a child with mobility impairments is one who is confined to a wheelchair. Other devices are also used by children and can include canes, walkers, ankle-foot orthotic, or AFO’s; these devices become a child’s means to move about. In most cases, children do not want to leave their assistive devices. It can be a strength and/or ability issue, or it could be a dignity issue as well. Special care and attention need to be given to ensure children, and adults as well, have the ability to be in the middle of a play episode of their desire. If there is that chance a child or adults wish to remove themselves from an assistive device, incorporating transfer stations can allow someone to participate in an activity and do it in a dignified way. For example, using a transfer for an elevated slide can be a way to open the possibility for sliding to more potential users (see photo below). Providing ways in which a child can experience height is a way for a child with mobility impairments to be included. Positioning a high point, or vista, in the middle of a group of play components can allow a child who may not to be able to participate physically in a given activity, but because they are in a power position, may be able to be involved socially in the play episode (see photo below). 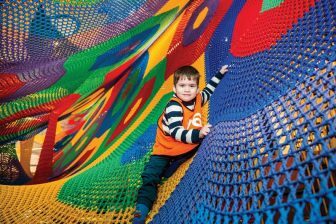 Inclusive play environments offer many different textures and sensations for users to experience. It could be using mist or fog, differing surface elements (as long as they comply with the ADA Standard), providing plant materials that give off a fragrance or make rustling noises in the gentlest of breezes, or using sound, light impulses, or vibration to guide users. For those children or users with cochlear implants, minimizing the electrostatic discharge, ESD, may be important. Some believe there is the potential to de-map the external device when exposed to a high rate of ESDs, while others say the technology is to a point where ESDs do not affect CIs. One may wish to take the side with most caution and offer non-plastic sliding activities or use grass turf surfacing that contains an anti-static agent. For children with cognitive disabilities, many factors play into the design development program for inclusive spaces. For instance, transitions and sensory overload can be a common issue for children leading them to act out. Providing many smaller spaces, or cozy spots can help a child to manage their emotions. The cozy spaces can be a space small enough for only one person, a space for an adult/caregiver and a child, or for a small group of persons. Within those cozy spaces, there can be some activity or component present to attract the child’s focus. Shade can also be an important inclusive play element. There are some children who have trouble controlling their own body temperatures as a result of medication – shade would be very important for them. Simple movement or vestibular play components may also be a stimulating activity for children as well. We are still learning more and more about inclusive play offerings for children with cognitive issues, those children in the autism spectrum in particular. 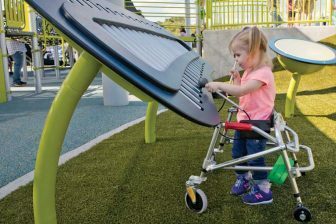 Many organizations have been created whose mission is to promote, design, and program inclusive play and playground for children of all abilities. Some of those organizations include; Boundless Playgrounds, Shane’s Inspiration, The Miracle League, The National Center for Accessibility, Unlimited Play, and KidSense. Through their hard work and persistence, inclusive play spaces are the expectation and right thing to do for all new play environments. So, C’mon, let’s ALL go to the park and play! Tony Malkusak, President/Landscape Architect of Abundant Playscapes has over 27 years of experience in the play and playground industry. He has worked for local parks & recreation departments planning and overseeing capital improvement projects such as playgrounds. He also spent 10½ years as the lead design person for a national not-for-profit organization specializing in the creation of inclusive playgrounds for children of all abilities.